$19 for an NFL Team Logo Mat from Groupon Goods. Shipping Included ($44.98 Value). 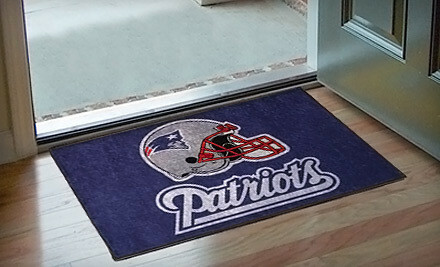 Officially licensed by the NFL, each interior mat lays the logo of your favorite professional football team in an entryway, on a bathroom floor, or around the shoulders of a shirtless tailgater. A chromojet printer dyes high-quality and high-luster yarn to keep mats vibrant under the soles of muddy shoes. Like Mount Rushmore and southern drawls, every 19″x30″ mat is made in the United States. For $19, you get a 19″x30″ NFL team logo mat (a $31.99 value) with shipping included (a $12.99 value) from Groupon Goods (a $44.98 total value). Choose from any of the league’s 32 teams.